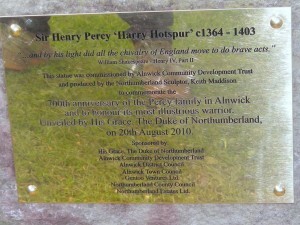 On Friday 20 August 2010, the, more than life sized, 14 foot high statue of Harry Hotspur was unveiled in Alnwick, Northumberland. 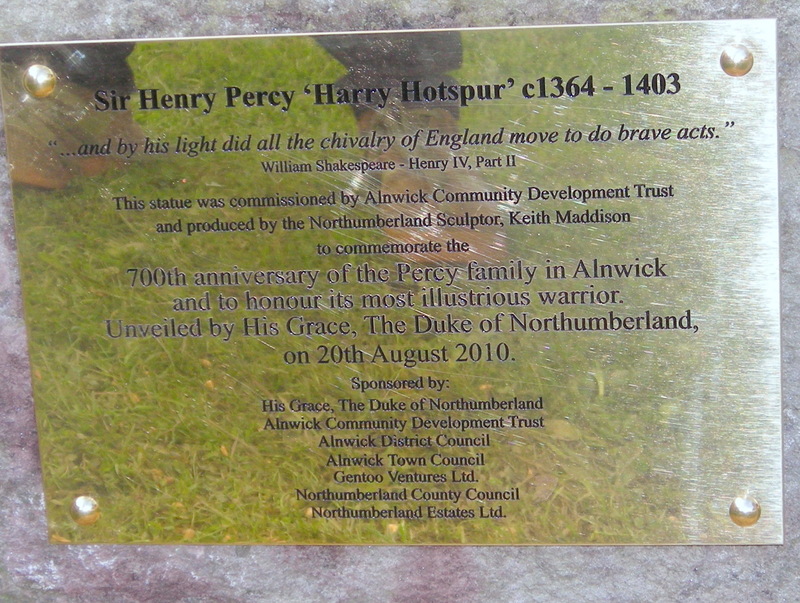 The idea of a bronze statue was to commemorate the 700 year anniversary in 2009 of the Percy family in Alnwick. One note of continuity is that no-one knew what his face was like as in all depictions of him, he had his visor down. So Earl George Percy, son and heir to the current Duke of Northumberland was asked to pose as the model for Hotspur’s face. As Lord George was 24, the same age as his ancestor, Harry Hotspur, when he fought some of his greatest battles, this provided a modern link to the Percy family still living in the castle here in Alnwick today. Many people only think of the name ‘Hotspur’ as referring to a football team or a children’s comic. In fact it was the name given to Sir Henry Percy, also called Harry Hotspur (20 May, either,1364/1366 – 21 July 1403) was the eldest son of Henry Percy, 1st Earl of Northumberland, 4th Lord Percy of Alnwick. 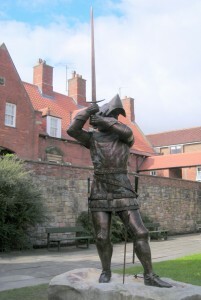 His nickname, ‘Hotspur’, is suggestive of his impulsive nature. He early acquired a great reputation as a warrior, fighting against the Scots and the French. Later, with his paternal uncle Thomas Percy, Earl of Worcester, he led a rebellion against Henry IV in 1403, forming an alliance with the Welsh rebel, Owain Glyndŵr. 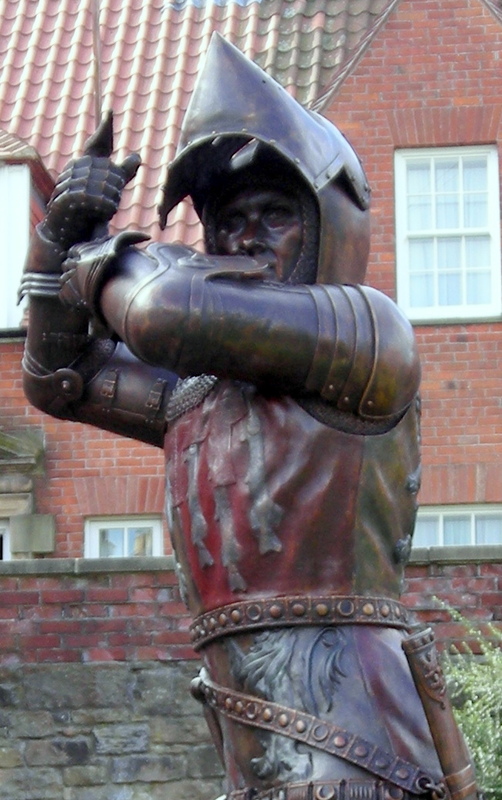 Before they could join forces, Hotspur was defeated and killed at the Battle of Shrewsbury when he raised his visor to get some air (as he was wearing plate armour which restricted air circulation) and was immediately hit in the mouth with an arrow and killed instantly. Henry IV, upon being brought the body after the battle, was said to have wept and ordered the body buried. Hotspur was buried in Whitchurch, Shropshire, but was later exhumed, by order of the same king, when rumours circulated that he was still alive. His body was first displayed in Shrewsbury, impaled on a spear, but was later cut up into four quarters and sent around all of England. His head was stuck on a pole at York’s gates. Today, in peaceful Alnwick, it was good to see such an amazing piece of art celebrating the past and present influence and presence of the Percy family through the ages. This entry was posted in Home - where all journeys start and end, Living History. Bookmark the permalink.